Bennetts Timber is pleased to announce that we are supplying larch cladding for a new Tesco Eco-Store currently under construction in Sunderland. The new store is designed with a timber frame and the cladding will be used as an external facing feature which will not only look great but is from a sustainably managed forest. 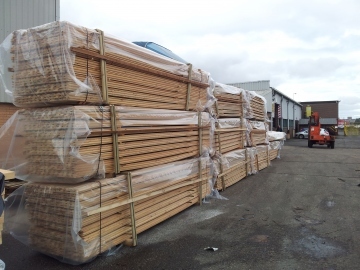 The photo shows recently machined larch in packs ready to transported to Sunderland.